Name. Shows the name of the selected Attribute. Also used for setting the name of of a new attribute. From v7.5.0 this input now rejects attempts to create an attribute name that contains operators like + or punctuation like ";". Suggested. Enter an optional list (semi-colon delimited) of suggested attribute values. Key attribute for selected notes. Ticking this box will add the attribute as a key attribute to all currently selected items (adding to existing key attributes if found). In general this is a less useful way of adding key attributes than using the control at the top of the text pane. As changing the value here changes the note's $KeyAttributes, it is not the best method to set/manage Key Attributes if using prototypes as the edit may break inheritance of the attribute (more on Key Attributes). From v7.2.0, if some selected items do not use this key attribute and some do, the box remains un-ticked. ticking it sets this for the whole selection. 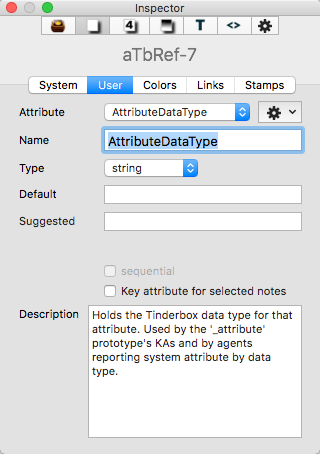 From v7.2.0, when a 'new attribute' is selected, the existing selected attribute name is retained but all other value input boxes on the Inspector are reset to their default; changing the data type also resets the appropriate default for that data type. User Attribute Inspector. When a new attribute is created, or when the type of an existing attribute is changed, the default value of that attribute is now reset to a conventional value. For example, the default value for a new numerical attribute is 0, and the default value for a new Boolean attribute is false. (1965) When a 'new attribute' is selected, the existing selected attribute name is retained but all other value input boxes are reset to default. Note: there is no undo for this operation. Select the attribute from the Attribute list. Name, Type, Default, Description and tick-box settings can all be changed. The changes take effect once focus moves off the edited input box. From v7.2.0, when a user attribute is renamed, the values of the old attribute are moved to the new attribute, and key attributes referring to the new attribute are updated to use the new attribute. But, before changing data type, do consider the effects: it may make more sense to make a new attribute of the desired type and use an agent to copy values across with whatever additional changes are needed over and above basic type coercion. Changes to the attribute name will update Key Attributes but do not update attribute names in action code (e.g. roles, edicts, etc.). If using action code in a TBX, consider this aspect before altering an existing attribute. Pre-v7.2.0. Note that if the Name of the attribute is changed, it is not changed in existing attribute values, rules and queries; these must be manually edited. So, if planning on renaming an attribute, first think about where you have code citing it and make plans to update that code at the same time.